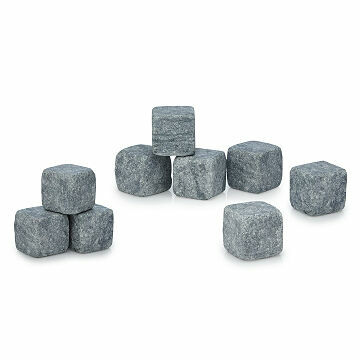 Make whiskey tasting ice cold and flavorful with this set of stones and glasses. Ice in your drink? It's a love/hate relationship. Andrew Hellman designed this clever set to help keep his favorite single malt scotch chilled without diluting its delicious flavors. Soapstone is ideal because it stays cold longer than ice and it's soft, so it won't scratch your glass. Give the design to a whiskey connoisseur or favorite party host, just make sure they invite you to their next tasting. Milled in Perkinsville, Vermont by the oldest soapstone workshop in the United States. Glasses made in Slovenia and the Czech Republic. Glasses are dishwasher safe. Not freezer safe. Fantastic product - I gave it as a gift and it was loved! The style of this product is outstanding. Will be used frequently and displayed! I brought the whole set with both the glasses and the stones as a birthday/Christmas present. Only one of the glass cups looked like good quality, the other one looked cheap and almost plastic like. The friend I gifted them to was cleaning one of the glasses and it cut his finger, and then it just crumbled into pieces.... According to the giftee, the stones actually warm up pretty fast. And he keeps them in the freezer all the time, not sure if it's supposed to be like that. I would not recommend getting the glasses, stick with just the stones. Love them. And my husband had never seen or heard of them. He loves them because they don't water his Scotch down. Handy pouch for keeping them in the freezer. Perfect Christmas gift. Love the unique shape of glasses, but smaller than expected. Husband claims stones don't stay cold very long. Like the gift set idea of glasses and stones together. Overall, didn't feel it was worth the price, but do not plan on returning. My husband is a whisky drinker and collector and he loved this gift. The glasses are beautiful and the stones work as advertised. Great gift!